I’m gonna start leaving these updates more cut & dry, just talking about the days workout, and then creating separate updates with more content and such. So, you cool cats be on the look out for that. It says Day 7 up there, but really I’ve been working at this routine for about 2 months now, trying to fine tune it. I’ve nailed multiple rep PRs, and honestly, I look better than ever. I really think in another week or two, I’ll have tweaked this bad boy to perfection. Today I unveil something I’ve been working on for quite a while. 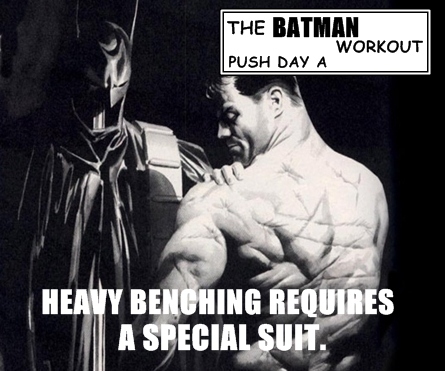 A workout that would be pretty damn close to one that Batman would do in real life. I’m actually going to be doing the workout myself, for around 4-5 months, and as always, track my progress here. I’ve taken my weight and measurements, and at the end of my time with this program, we’ll see what’s what. Before we get started and I explain why I’ve done what I’ve done, let me just say that Batman would 100% be on steroids. He would be an absolute fool to not be. As a billionaire, he’d be able to get a hold of the greatest and safest forms of anabolics, and constantly be under the supervision of a doc to make sure he stayed healthy. Now, the reason I say he most definitely would, and be foolish not too, is because of how great steroids are. Batman would need to be superman in a lot of ways, with size & strength being the two most important. First of all, he has to appear intimidating, and size is gonna do that. Second, he’s gonna be getting in a lot of fights, climbing up and around buldings, so he has to have that massive strength. Third, he’s obviously going to be injured, and steroids help to make recovery ridiculously fast. So, yes, Batman would mos definitely be on the Venom. I’m not gonna explain absolutely everything about the program right here, instead I’m going to do so over the next week, with all the updates that I do. You’re going to see it’s some what similar to the Powerbuilding routine I was just doing, but there are some big changes. First things first, Batman needs to be STRONG. Strong enough to throw people around like it’s nothing. To pull himself up via a ledge, or a rope. To pick up deadweight, and large objects. That would be the first and most important thing to him, so it’s going to be the first and most important thing to us. In my experience, Jim Wendler’s 5/3/1 has been the best tool for building strength, and it goes like this. You have to figure out what your max is on the lifts. Now, if you’re afraid to test your max, and I don’t blame you, you can do it through an equation. Let’s say you did 5 reps of 225 on the bench. As in, 5 reps was all you had, it was all left in the bucket. So, now it goes a little something like this; the weight you did, times the reps, times .0333 plus the weight you used. So it looks like this: 225x5x.0333+225 = 262lbs. Now, you take that number, I round, so 260lb, and figure out what’s 90% of that. Which turns out to be 235lbs. OK, now that’s your max, you work off that. The reason for this is that a lot of guys over-estimate their max. Now, training a bit light lets you progress slowly, and build confidence. Because when you see that your goal is a single rep, but you bust out 4 or 5, you feel damn good. It doesn’t take you nearly as long to plateau, if that even happens, and you keep at it. The first week it’s 65, 75, and 85% of your max, in sets of 5. However, on the final set you do as many as possible. The second week it’s 70, 80, and 90 all sets for 3, again, except for the final one. Finally, the 3rd week is 75, 85, 95, with the sets going 5, 3, 1. Again, 1 rep is the goal, but try and snag as many as you can. Then the 4th week is a deload week, with all sets at just 5 reps, and the percentage real low, such as 40, 50, and 60. I tend to use those days to lift explosively. Alright, tomorrow I discuss more details about the workout, with videos coming soon. Until then, riddle me this: What is a man who’s fat, yet buff? FatBuff!